MicroRNAs (miRNAs) encoded by latency-associated transcript are associated with both latent and acute stages of herpes simplex virus 2 (HSV-2) infection. In this study, miRNA-H4-5p and miRNA-H4-3p were ectopically expressed in HeLa cells to explore potential cellular targets of viral miRNAs and demonstrate their potential biological functions. The results showed that miRNA-H4-5p could reverse apoptosis induced by actinomycin D (Act-D) and promote cell cycle progression, but miRNA-H4-3p had no such obvious functions. Bioinformatics analysis, luciferase report assay, quantitative reverse transcription polymerase chain reaction (qRT-PCR), and Western blotting demonstrated that miRNA-H4-5p could bind to the 3′-untranslated region (UTR) of cyclin-dependent kinase inhibitor 2A (CDKN2A) and cyclin-dependent kinase-like 2 (CDKL2) to negatively regulate their expression. We verified that these two targeted genes were associated with cell apoptosis and cell cycle. Furthermore, in HeLa cells infected with HSV-2, we detected significantly reduced expression of CDKN2A and CDKL2 and demonstrated the negative regulation effect of miRNA-H4-5p on these two target genes. 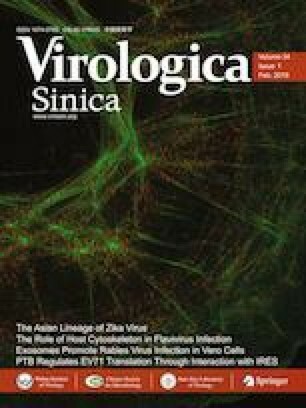 Our findings show that viral miRNAs play a vital role in regulating the expression of the host’s cellular genes that participate in cell apoptosis and progression to reshape the cellular environment in response to HSV-2 infection, providing further information on the roles of encoded herpesvirus miRNAs in pathogen–host interaction. The online version of this article ( https://doi.org/10.1007/s12250-019-00101-8) contains supplementary material, which is available to authorized users. This work was supported by the National Natural Science Foundation of China (81371749) and (81171511). HY and JF designed the study; YZ, JY and YL performed the experiments; YZ and JY analyzed the data; YZ and YL wrote the manuscript; HY and JF finalized the manuscript. All the authors approved the final manuscript. The authors declare that they have no conflict of interest. This article does not contain any studies with human or animal subjects performed by any of the authors.